I hardly think so. From the way the hero is described, he was at the time someone willing to be very independent, that’s why he went hiking alone not telling anyone in the first place. So social media or no social media, that wouldn’t change his personality. But what caught my attention was how he used technology as a life recorder. That was very interesting to observe. He went hiking all alone but to accompany him he brought a camera and a camcorder, but very strangely no phone. If smartphones existed at the time (iPhone introduction: 2007), would that change the story? Maybe he would have brought a phone with him for the GPS or even just the camera, even if there is still the battery problem. But still, it’s a major OOPs to not bring a phone in this kind of adventure. Anyway, those 2 gadgets, camera + camcorder were his “buddies” during his hike, because at every moment he recorded himself, took snapshots, he recorded his life there. And during the endless desperate moment when he was stuck, he entertained himself with those gadgets, and still thought of recording his thoughts and life there. Technology became something like a companion that kept him company. 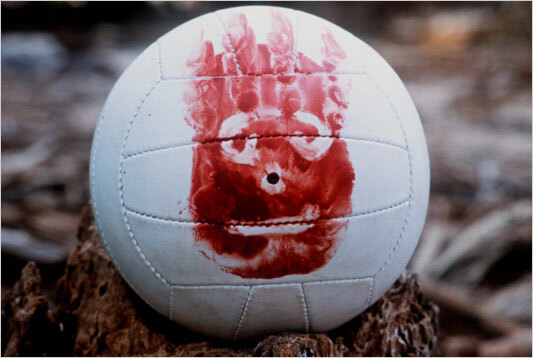 It filled the same function as the volley ball (Wilson) in “Cast away” – a movie with Tom Hanks where he is also stuck, on a desert island, and turns a volleyball into a human head to keep him company. If the story was in today’s context, I would say that he recorded his life only to share on facebook and get the maximum likes or whatever. But since the character is so independent, that’s not it. Actually it seems he records anything he does just for himself, to remember his life, relive moments, not necessarily to compulsively share. That’s the origin of why we record things: to remember. I liked the way the character thought of documenting what was happening to him by recording everything even if it was not going to be a good memory. Not everyone has this reflex of documenting things. Photographers do this, journalists too, but more and more now we also do it, we document our life. But the things that we document are not necessarily meant to be widely shared. Documenting is rather a personal activity. You do that to remember. That’s the use of technology I like, the documenting part, it’s interesting that people use technology as a life recorder for themselves. Anyway, I am a little disappointed that in the end technology didn’t save the hero, other humans did (good too), but I wish technology was a little more useful in this kind of literally “stuck” situation. It should be, we have everything we need to make it more helpful. Update : I’ve also seen the movie “Mr. Bean’s holiday” and it’s the same use of technology that is shown, he brings his camera everywhere as a personal life recorder. Very funny movie.